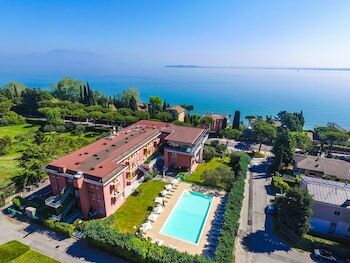 Located in Desenzano del Garda, Hotel Oliveto is on a lake, within a 15-minute walk of Roman Villa of Desenzano del Garda and Cathedral of St. Mary Magdalene. Featured amenities include a computer station, dry cleaning/laundry services, and a 24-hour front desk. Planning an event in Desenzano del Garda? This hotel has 3229 square feet (300 square meters) of space consisting of a conference center and meeting rooms. Free self parking is available onsite. When you stay at Agriturismo La Collina del Sole in Perugia, you'll be 14 minutes by car from Abbey San Salvatore di Montecorona. Free self parking is available onsite.